Canada needs a postal bank. Thousands of rural towns and villages, and some Indigenous communities, don't have a bank – but many of them have a post office that could provide financial services. As well, nearly two million Canadians desperately need an alternative to payday lenders. Wouldn’t it be great if there were a better option than the big banks? A postal bank could be that alternative. Many postal systems around the world operate banks that provide inclusive access to banking, fund economic development and help increase revenue to preserve both our public postal service and jobs. We had a postal bank in Canada up until 1968. It's time to bring it back. While the recent government review of Canada Post did not specifically mention postal banking, it left the door open for revenue generating services. Irene Mathyssen, NDP MP for London-Fanshawe, has put forward a motion (M-166) for conducting hearings and proposing a plan for postal banking. Postal Banking is also a key CUPW demand during the current round of CUPW-Canada Post collective bargaining. 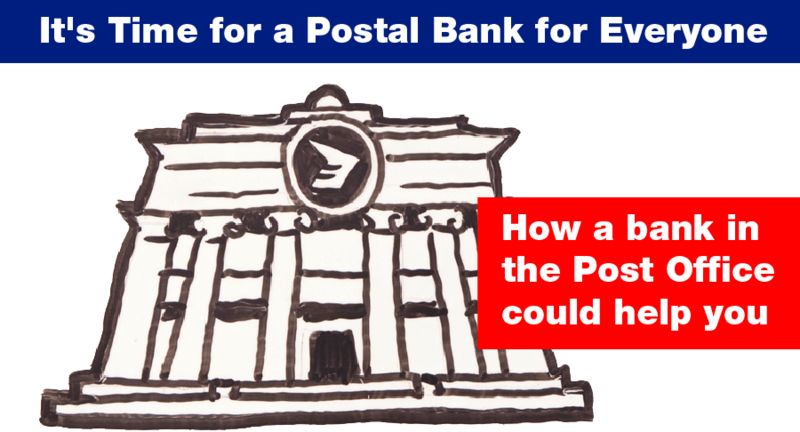 We invite you to explore postal banking through a series of videos, blogs and graphics that explain what it is, why we need it and how it could work for Canadians. Be sure to check CUPW's Facebook page, Twitter account, CPAA's Facebook page and Twitter account on a regular basis for new items to share with your friends and networks. What are the big banks afraid of? Video of What are the big banks afraid of? Video of A Bank for Everyone! Simple ways you can help support postal banking right now! Connect and share our #ABankForEveryone videos, blogs, graphics and more! This is an action alert list for those who care about postal banking and are willing to share online content promoting this idea. Let's reach out to all Canadians and put pressure on decision makers to do the right thing! Alerts will be sent twice a week on average and will contain links to content promoting postal banking and detailed instructions on how to share it with your peers. We may also send you campaign updates and other information from time to time. You can unsubscribe at anytime by clicking the unsubscribe link in the campaign's emails. IMPORTANT: Some mail clients will send our emails to their promotions tab instead of your regular inbox. Please add our <feedback@cupw-sttp.org> email address to your contacts.